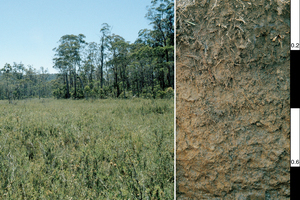 The picture on the right shows a Redoxic Hydrosol soil profile at a subalpine site in Bago State Forest, southern New South Wales. On the left is a typical landscape showing closed heathland with adjacent forests dominated by Alpine Ash (Eucalyptus delegatensis), east of Tumbarumba, NSW. Photographer : Neil McKenzie on January 01 1996.